Fiberglass handrail, pultruded grating, decking, structural shapes and plate from Strongwell offer an attractive, low-maintenance and long-lasting alternative to steel and wood in corrosive marine and freshwater environments. Architectural fiberglass handrail systems are strong, attractive, and able to withstand corrosive salt-water environments with ease. Systems can be made to meet ADA requirements and a variety of colors, pickets and rails can be combined to create a unique handrail system that adds safety and beauty to your property. Standard DURADEK® and custom DURAGRID® pultruded fiberglass grating are available in a wide variety of bar shapes and spacings to meet your specific needs. As an added safety feature, Strongwell's pultruded grating can be ordered with a durable non-skid surface, perfect for the sometimes slippery environments found around docks and marinas. EXTREN® structural shapes and plate are the ideal replacement for wood and metal structural materials in both marine and freshwater environments. 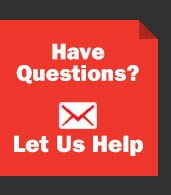 Strongwell offers more than 100 standard shapes to meet all of your structural fabrication needs. 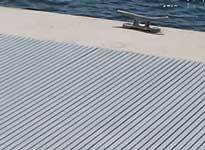 Strongwell's SAFPLANK® interlocking decking system is an excellent surface material for marina walkways and docks. 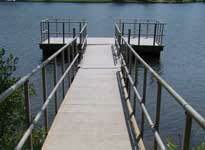 The lightweight, corrosion- and rot- resistant material installs quickly and requires virtually no maintenance. SAFPLANK® is also low in thermal and electrical conductivity, making it safe for bare feet. For marine structures such as seawalls and bulkheads, Strongwell manufactures Sheet Piling (Z and Box shapes), offered by CMI, which provide value added sustainable solutions for the construction and engineering communities. UltraComposite Sheet Piling provides high performance, long life-cycle and low environmental impact solutions at substantial cost savings. 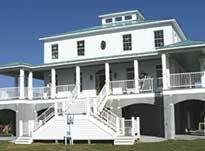 Traditionally, seawalls and bulkheads are made of steel, concrete, or treated wood. However, composite materials have been used for decades in structural applications including bridges, oil rig production platforms and even as military armor. FRP Sheet Piling is a cutting edge building product that offers many advantages over traditional materials such as steel. 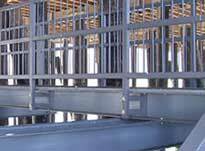 Compared to steel, UltraComposite Sheet Piling offers extensive corrosion resistance and ease of handling and shipping, translating into substantial cost savings. UltraComposite Sheet Piling is often specified for seawalls in areas that cannot tolerate the environmental impact of toxic coatings or continual maintenance, two of the major shortcomings for steel piling.